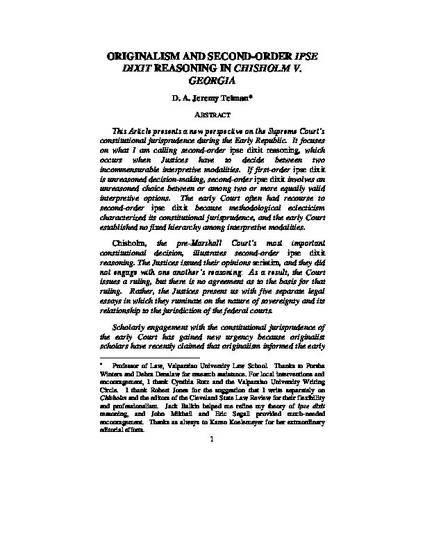 Chisholm, the pre-Marshall Court’s most important constitutional decision, illustrates second-order ipse dixit reasoning. The Justices issued their opinions seriatim, and they did not engage with one another’s reasoning. As a result, the Court issues a ruling, but there is no agreement as to the basis for that ruling. Rather, the Justices present us with five separate legal essays in which they ruminate on the nature of sovereignty and its relationship to the jurisdiction of the federal courts. Scholarly engagement with the constitutional jurisprudence of the early Court has gained new urgency because originalist scholars have recently claimed that originalism informed the early Court’s approach to constitutional interpretation. This Article finds that contemporary filters do not capture the essence of eighteenth-century constitutional adjudication. Like modern textualists, the Justices of the Chisholm Court begin their inquiries with an examination of the constitutional text. However, the constitutional text rarely provided clear constraints on the early Court’s discretion because, to borrow language from New Originalists, their cases arose in the “zone of construction” where original meaning “runs out.” Justices chose among plausible arguments about the Constitution’s meaning. At key points, the Justices simply declared what the law was. They did so, not without justification, but also not based on evidence of the Framers’ intent or the original meaning of the constitutional text.